Globally, rapid and unplanned urbanization is the trend for most of the developing countries including India. Worldwide there is a huge outcry about its impact on the rapidly exhausting scarce resources for development. Although the same is echoed in India, not enough attention has been paid on the crucial linkage between the crippling waste disposal system; a byproduct of the population explosion and degradation of both environmental as well as human health. Waste being highly heterogeneous entity; it is not uncommon to find night soil and untreated waste generated from health care facilities in India. Class I cities of this country where 65.2% of the population resides, generate 23.86 million tonnes of the solid waste. Here, urban municipal waste includes commercial and residential waste generated in municipal or notified areas in either solid or semisolid form and also treated biomedical waste. In India, expenditure for solid waste management ranges from Rs. 342 to Rs. 2446 per metric tonne of municipal solid waste, but the waste collection efficiency ranges from below 50% to 90%. This is because the existing regulatory framework for environmental protection is not being stringently implemented due to the absence of sustainable commitment from the government and relative apathy at the community level. Negative impact of this obstinate issue is reflected on the environmental depletion and added disease burden in this developing country. In India, informal sector of solid waste management also plays an important role in addition to the formal sector. Formal sector of solid waste management is represented by a hierarchically structured bureaucracy while an informal sector by ragpickers, middlemen and wholesale dealers. Mumbai, a financial capital of the nation generates municipal solid waste of 7025 MT/day. Despite of the huge budgetary provision for its management, efficiency of the services is not clearly up to the mark. Around 11-13% of the total volume of the waste in this city is handled by approximately 80,000 door to door waste collectors and 50,000 to 60,000 who collect waste on the streets and dumping ground. Ragpickers who are at the bottom of the hierarchy in the informal solid waste management sector after sorting the waste, sale to middlemen from where it is goes to further processing and recycling through wholesale dealers. While earning their livelihood, ragpickers contribute significantly to the environment. However, they rarely have both social and occupational recognition in this country. This may have worse impact on the most vulnerable group of ragpickers like women and children. Primary aim of this study was to assess morbidity profile of the women ragpicker members of a non-governmental organization, in Mumbai. Other objective was to study their occupational details, socio-demographic and reproductive health profile, awareness about the infectious disease transmission and personal hygiene measures practiced including health seeking behavior. In addition to this, few selected participants were trained as health volunteers to raise awareness about the prevailing health problems in the community. A leading Non Governmental Organization (NGO) working for women ragpickers located at Deonar, Mumbai's largest dumping ground was approached. Required permission from the management of the NGO and appropriate ethical clearance were obtained. By systemic random sampling, 168 women ragpickers were selected and explained purpose as well as nature of the study. All invitees agreed to participate in the study and written informed consent was obtained. This study was conducted at the field office of the NGO from October 2003 to April 2005. With the help of pretested semi-structured questionnaire, socio-demographic history and details pertaining to occupation, addiction and morbidity were elicited from the participants through one to one interview. Also, their awareness about the diseases spread by handling solid waste and personal hygiene practices including health seeking behavior was assessed. History of illnesses in the past 3 months and 1 year was recorded as present and past history, respectively. After conducting through clinical examination, they were offered blood investigation for detection of anemia, deworming and two doses of tetanus vaccine. Screening for anemia was done by Sahli's method with a cut off level of 10-12 gm% for mild anemia, 8-10 gm% as moderate anemia and less than 8 gm% as severe anemia. Oral iron therapy for 3 months was prescribed to anemic participants. Symptomatic treatment was given and appropriate health advice was given wherever indicated. Compliance toward interventions was 100%. In order to create and spread awareness regarding common health-related issues among the ragpickers and the community where they reside, 14 (8.33%) participants were trained as health volunteers. They were selected on the basis of their keen attitude toward learning and willingness to give time for the same. A need-based training curriculum was specially designed with the help of a well-renowned NGO in the field of health education. It dealt with the important aspects of health such as general hygiene, anemia, mother and child care as well as care in common illnesses. Training was conducted at the field office of the organization for 2 hours day for 7 days at the convenient time of the participants and organization in the local languages with the help of lectures, flip charts, posters, role-play and brainstorming sessions. Knowledge of the participants regarding was assessed 2 weeks after completion of the training program. The data was analyzed using SPSS version 11.0 software program (SPSS Inc., Chicago, Illinois, USA). 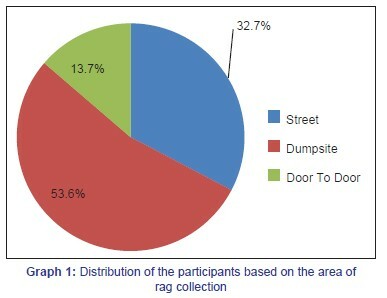 Distribution of participants based on their areas of rag collection is represented in Graph one. Terms DTDWC, SRP and DRP represent Door to Door Waste Collectors, Streetside Rag Pickers and Dumpsite Rag Pickers, respectively. Majority 130 (77.38%) participants were from 21 to 40 years of age group and mean age was 33.5 years. Buddhist religion [90 (53.6%)] outnumbered Hindu [68 (40.4%)] and Muslim [10 (6%)] in ragpicking population. There was no significant difference in the educational status between DTDWC, SRP and DRP (χ2 = 2.89; df = 6; P > 0.05). Reasons given by the respondents for adopting ragpicking as an occupation were poverty (91%), easy entry (39.9%), no requirement of skill and capital (37.5%), flexibility of timing (19.6%), independence (10%) and unemployment (1.8%). Majority 91 (54.1%) participants used to collect up to 10 kg of waste per day, 60 (35.7%) and 17 (10.1%) of them used to collect 11-20 kg and 21-30 kg of waste per day, respectively. Seasonal variation in the quantum of waste collected was observed. 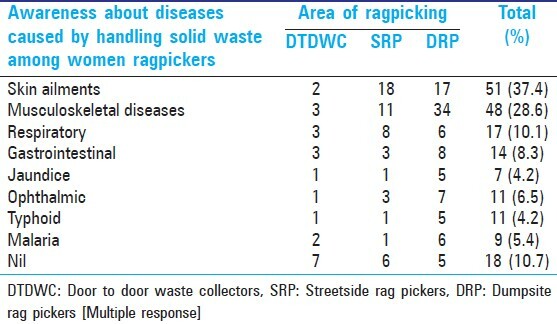 Five DTDWC (21.7%), 9 (39.1%) had been collecting waste since <10 years, 10-20 years and >20 years each. Fifteen (27.3%), 20 (36.4%) SRP were into ragpicking since <10 years, 10-20 years and >20 years each. Seventeen (18.9%), 32 (35.6%) and 41 (45.6%) DRP were into this occupation since <10 years, 11-20 years and >20 years, respectively. Mean number of years spent in ragpicking was 20.04 years. According to modified Kuppuswami classification, 9 (39.1%) DTDWC, 25 (45.5%) SRP and 12 (13.3%) DRP were from the upper lower socioeconomic group. Respondents from lower lower socioeconomic group included 14 (60.9%) DTDWC, 30 (54.5%) SRP and 78 (86.7%) DRP (χ2 = 19.6; df = 2; P < 0.001, significant). This can be attributed to the lower income derived from collecting waste at dumpsite. Average income derived from ragpicking was Rupees 25-80/day. Out of 129 (76.7%) married respondents, 12 (52.2%) were DTDWC, 41 (74.5%) were SRP and 76 (84.4%) were DRP. Among 22 (13.1%) widow participants, 5 (21.7%) were DTDWC, 7 (12.7%) and 10 (11.1%) were collecting rags along street side and dumpsite, respectively. 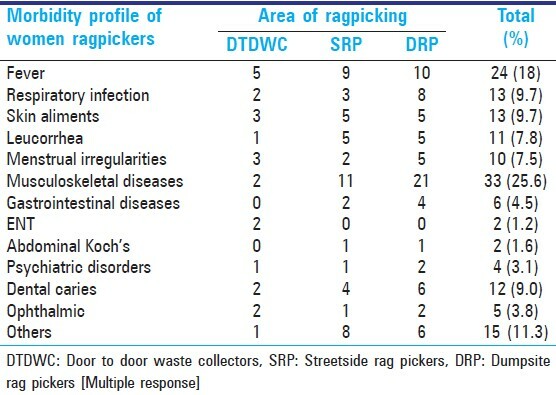 Among 15 (8.9%) separated participants, 7 (12.7%) were picking waste along street side, 4 were DRP and DTDWC each. Only 2 (1.2%) DTDWC were unmarried. 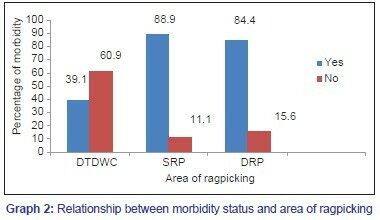 Majority of ragpickers 147 (87.5%) were below 18 years at the time of marriage [14 (60.9%) DTDWC, 49 (89.1%) SRP, 84 (93.3%) DRP]. Only 2 (8.7%) DTDWC, 8 (14.5%) SRP and 10 (11.2%) DRP had less than or equal to 2 children. Eight (34.8%) DTDWC, 27 (50.9%) SRP and 50 (56.2%) DRP had three to five children. More than 5 children were borne by 7 (30.4%) DTDWC, 13 (23.6%) SRP and 27 (31.1%) DRP. Only 11 (47.8%) DTDWC, 17 (30.9%) SRP and 45 (50%) DRP were registered themselves for antenatal care during the last pregnancy. Majority of them, 50 (68.5%), were registered in first trimester itself but only 20 (27.3%) had regular follow up! Only 9 (39.1%) DTDWC, 19 (34.5%) SRP and 52 (57.7%) DRP had hospital delivery in their last pregnancy. Twelve (52.2%) DTDWC had home delivery during the last pregnancy as compared to 27 (49.1%) SRP and 34 (36.7%) DRP, respectively. From above analysis, two (1.2%) unmarried participants and 7 (4.2%) and 6 (3.6%) of the respondents were excluded due to primary infertility and spontaneous abortions, respectively. Out of 153 respondents who borne children, only 4 (17.4%) DTDWC, 3 (5.5%) SRP and 2 (2.2%) DRP had practiced exclusive breast feeding for 6 months. Contraception use was seen in 110 (65.5%) of the married respondents. Tubal ligation was the most preferred method of contraception, among 7 (30.4%) DTDWC, 31 (56.6%) SRP and 58 (64.4%) DRP. Copper T was used by two (8.7%) DTDWC, three (5.5%) SRP and six (6.9%) DRP. Oral contraceptive pills were used by one of DTDWC (4.3%) and DRP (1.1%) each. Only one (4.3%) of DTDWC's partner was using condom as a barrier method of contraception. Self-reported addiction history was present in 113 (67.26%) participants. Eight (4.8%) DTDWC, 10 (28.6%) SRP and 25 (40.3%) DRP had habit of pan chewing. Tobacco addiction was reported by 12 (75%) DTDWC, 25 (71.4%) SRP and 40 (64.5%) DRP. Betel nut was consumed by 4 (25%) DTDWC, 12 (34.3%) SRP and 20 (32.3%) DRP. Only one (6.25%) DRP reported alcohol use. Reasons for initiation and continuation of addictions given by the participants were filthy work conditions [44 (38.9%)], to work faster [22 (19.5%)], family problems [15 (13.3%)]. Only 20 (17.8%) of the respondents admitted that they got addicted. Twenty-three (23.35%) participants did not attribute addiction for any reason. Significant association between morbidity and area of rags collection is indicated by Graph 2 (χ2 = 27.8; df = 2; P < 0.001 significant). Present morbidity profile of the participants is illustrated in the [Table 1]. Only eight (4.8%) had hemoglobin level above 12 gm%. Five (3%) participants which included three (13%) DTDWC and two (3.6%) SRP had severe anemia with the hemoglobin level of less than 8 gm%. Four (17.4%) DTDWC, 13 (23.6%) SRP and 6 (6.7%) DRP had hemoglobin level between 8 and 10 gm%. One hundred and thirty-two (78.6%) had mild anemia with the hemoglobin level of 10-12 gm% [15 (65.2%) DTDWC, 38 (69.1%) SRP, 79 (87.8%) DRP]. Difference in rise of hemoglobin level after anemia correction measures was statistically significant [Z = 12.7 (P < 0.05)]. Seventy-two (42.9%) participants had given history of illnesses in the past 1 year which included 7 (30.43%) DTDWC, 31 (56.4%) SRP and 34 (37.7%) DRP. Three DTDWC (13%) had past history of gastrointestinal illnesses of recurrent pain in abdomen; passing of worms in the stool, diarrhea etc., Two (4.3% each) had given past history of tuberculosis of lungs and jaundice, respectively. Two DTDWC (8.7%) had complained of fever in the past. Eight SRP (14.5%) had past history of fever and respiratory tract infections each. Three (5.45%) had given history of Koch's in the past, of them 2 had completed Antikoch's treatment. Five women (9.09%) each had given history of skin aliments and jaundice. Seven (12.7%) of them had history of passing of worms in the stool, flatulence and acidity, constipation with pain in abdomen. Twelve DRP (13.3%) had complaints of passing worms in stool, acute dehydration from diarrhea or dysentery, pain in abdomen etc., One DRP (1.1%) had given history of jaundice in the past. Past history of fever was reported by six DRP (6.7%) in the past and seven (7.8%) had history of respiratory infections in the form of Koch's, chronic cough, recurrent cough and cold. Six respondents (6.7%) had skin aliments in the form of cut or injuries, burns, boils; rashes etc., Past history of illnesses reflected under nutrition, abysmal living conditions. Past history of dog bite was given by 23 (25.6%) DRP, 6 (10.9%) SRP and 1 (0.6%) DTDWC (χ2 = 16.9; df = 2; P < 0.001, significant). Only two (6.7%) had completed post exposure prophylaxis for rabies from nearby municipal dispensary. Awareness of the participants regarding diseases caused by handling of solid waste among the participants is illustrated in [Table 2]. One hundred forty-one (83.92%) had practiced one or more hygiene practices regularly in the form of change of clothes after work (74.5%), daily bath (30.5%), hand washing with soap and water after work (16.3%), nail trimming (18.4%). A first preference to the municipal hospitals during illnesses was given by 42.9% of women ragpickers. Forty seven (28%) and 31 (18.5%) of the respondents preferred vaid and homemade remedies respectively during illnesses. However, visiting to the municipal hospitals meant a loss of daily income and so it was reserved in case of chronic and serious illnesses! There was significant improvement in knowledge of the 14 participants after 2 weeks (t = 5.36; df = 13; P < 0.001) of training on general hygiene, reproductive health, anemia prevention and control, care in minor illnesses reproductive health. One hundred forty-seven (87.5%) of the participants faced obstacles at the workplace. Most of them reported cheating by middlemen (55.7%), intimidation by police (20.4%), harassment by local hoodlums (17.6%) and municipal workers (17%), and strained relationship with the colleagues (12.2%). Majority of the respondents, 14 (60.9%) DTDWC, 43 (78.2%) SRP and 66 (73.3%) DRP, believed that the nongovernmental organization working for them gives them develop as collective strength to mitigate work-related issues. While three (13%) DTDWC, six (10.9%) SRP and six (6.7%) DRP did not feel the same. Six (26.1%) DTDWC, 6 (10.9%) SRP and 18 (20%) DRP declined to comment this question. Predominance of Buddhist religion and low priority of education was a similar finding. Adverse work condition, poor nutrition, inability to practice personal hygiene measures were the contributory factors reflected in their morbidity profile. ,,,, Key determinants of health of participants like reproductive health, addiction, knowledge about diseases spread due to handling of solid waste and personal hygiene practices, health seeking behavior could not be compared. Recommendations: While earning own livelihood, these women are not only contributing toward reduction in the mammoth expenditure incurred by the formal sector of solid waste management also to the city's environment by reducing burden on limited landfill spaces. While catering needs of the society, their own unfulfilled needs but not even acknowledged. Merely treating morbidities of the ragpicker members through health camp approach will not suffice to fulfill their health needs. A long-term occupational health program with well-placed monitoring mechanism should be designed entailing periodic medical checkup, continued health awareness activities about the prevailing health and related issues to the local community and their prevention and control measures is at the most very essential. Though this can be facilitated by the trained health volunteers from NGO, entire onus should not be there on NGOs working for this socially and occupationally disadvantaged section of the society. Sustainable support from the government and community participation are also equally important. Efforts should be made not only to sensitize but also to practice environmental education at the community level. Government should play a key role for provision of accessible health care services, extension of social security coverage to the ragpickers. Legitimization and enhancement of the role not only played by ragpickers but also then entire informal sector of solid waste management is the need of the hour. This win-win situation will be of immense value to address twin problems of poverty and environmental degradation which are characteristic of not only India but also other resource poor developing countries with the growing population burden! Due to time constraints, only one NGO working for women ragpicker members was involved and impact evaluation of the training imparted could not be done. Therefore, results of this study cannot be extrapolated to those who are still not organized, other age groups and gender. A huge potential for ongoing research on the ragpicking population exists not only for doctors, health planners, policy makers, social and behavioral scientists which may be common interest to environmental scientists and economists! National Solid Waste Association of India Newsletter June 2003: Inaugural issue urban municipal Solid waste management. June 2003. Government of India (1999) Report of the committee constituted by the Hon' ble Supreme Court of India- Solid waste management in Class-I cities in India, New Delhi: 1999. Dr. Sneha Palnitkar. The wealth of waste, waste recycles for Solid Waste Management A study of Mumbai. 2 nd ed. Mumbai: All India Institute of Local Self Government; 2004. p. 20. Dr. Sneha Palnitkar. The Wealth of Waste: Waste Recycles for Solid Waste Management - A study of Mumbai. 2 nd ed. Mumbai: All India Institute of Local Self Government; 2004. p. 34-6. Venkateswaran S. The Wealth of waste. waste pickers, Solid wastes and urban development'. New Delhi: Friedrich Ebert Stiftung; 1994. p. 49-50. Bal kumar KC, YogendraBahadur Gurung, Keshab Prasad Adhikari,Govind Subedi Investigating the Worst Forms of Child Labour number 4: Nepal, Situation of Child Ragpickers. A rapid assessment' International Labour Organization. International Program on Elimination of Child Labour;November 2001. p. 20-5. Available from http://www.ilo.org/ipecinfo/product/download.do?type=document&id=2381, [Last accessed on 2004 Mar 16]. Sanson CG. Working and Living Conditions of Ragpicker Children- findings of a research study welfare of Ragpicker Children. Report of the workshop national Institute of Public Cooperation and Child Development. New Delhi: 1986. Bhide AD. Regional overview on solid waste management in South East Asia Region. New Delhi: World Health Organisation; 1990. Ray MR, Mukherjee G, Roychowdhury S, Lahiri T Respiratory and general health impairments of ragpickers in India: A study in Delhi. Int Arch Occup Environ Health 2004;77:595-8. Report of workshop on 'Women Occupational and reproductive health: Research evidences and methodological issues.' February 1998 page 23-25. Organised by Centre For Health Studies, Tata Institute of Social Sciences, Mumbai, and International Labour Organisation, New Delhi: 1999. Available from: http://www.abms.org/newsearch.asp [Last accessed on 2005 Sep 3]. Palnitkar S. The wealth of Waste: Waste Recyclers for Solid Waste Management-A study of Mumbai. 2 nd ed. Mumbai: All India Institute of Local Self Government; 2004. p. 64. Palnitkar S, Srinivansan V. The Intersection of Poverty and Solid Waste Management. 1 st ed. Mumbai: All India Institute of Local Self Government; 2004. p. 58-9.